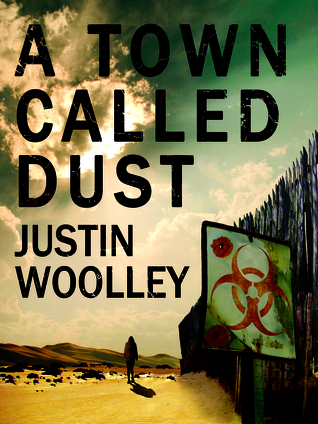 Debut author Justin Woolley's A Town Called Dust is the first book of The Territory series. Stranded in the desert, the last of mankind is kept safe by a large border fence... Until the fence falls. When the border fence is breached, the Territory is invaded by the largest horde of undead ghouls seen in two hundred years. Squid is soon conscripted into the Diggers- the armed forces of the Territory. And after Lynn finds herself at odds with Territory's powerful church, she too escapes to join the Diggers. 1. I loved Woolley's post- apocalyptic society created in this book. It has interesting characters and wonderful intrigue throughout the story. I thought the setting of Australia lent itself so well to the setting of the story, although it is really based on Woolley's descriptions and animals mentioned that I really figured out it was in Australia. Plus the hints of steampunk thrown in make me like it even more. 2. I found the ghouls, which are very zombie like creatures, fascinating. I hope that Woolley continues to expand on what they are and how they were created. In their extreme dryness, and search for moisture, they remind me a bit of the zombie like creatures in Kresley Cole's The Arcana Chronicles. 3. I liked the character of Squid. He was socially awkward, boarding on Aspergers, but he still managed to come off as kind and extremely smart. There is more to this boy than even he knows. 4. I was not a big fan of Lynn. While she sees the error of her ways, in the beginning she is definitely prejudice to those not living in Alice. Too many times she acts before she thinks, and lets her temper get the best of her. 5. I really enjoyed reading the power struggle between the Administrator and the High Priestess. The way the Priestess manipulated the Administrator was masterful. That being said the views and the power of the church in the Territory was very scary. Oh and the prophecy revealed at the end has me excited to see where the series goes.